This is a super cute and totally simple fall craft. I had a lot of fun with my two daughters a few years ago when we all made one. I leave mine out from September through November every year! 1. Using the Sharpie marker, draw a circle around the stem of the pumpkin. 2. Measure the distance between the legs of the teddy bear and use the marker to draw circles on the pumpkin where the legs will go. 3. Measure the distance between the teddy bear’s legs and arms, and the distance between his two arms and use the marker to draw circles on the pumpkin where the arms will go. 4. Using the Exact-o Knife cut the holes in the foam pumpkin as marked. 5. Use the top piece of the pumpkin as a hat for your teddy bear, gluing it into place using the hot glue gun. Discard the other pieces of pumpkin. 6. Place your teddy bear inside of the pumpkin, carefully pulling his arms and legs through the corresponding holes. 7. 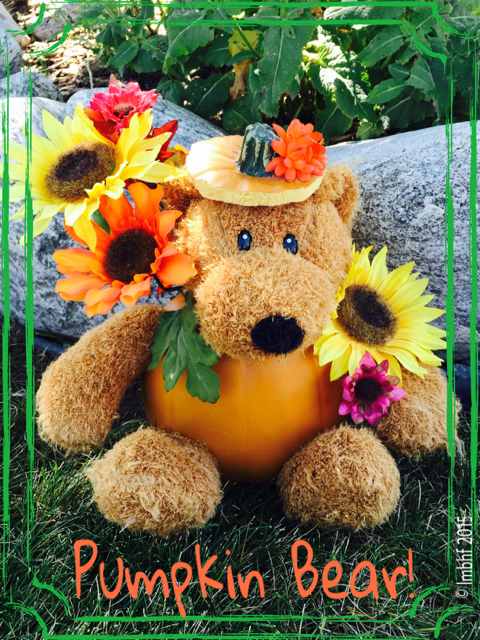 Finally, use the artificial fall leaves and flowers to add colorful embellishments to your Pumpkin Bear. Glue them into place using the hot glue gun. And there you have it, an adorable Pumpkin Bear to add to your festive fall decor! Oh gosh,he is just too adorable. Thanks for sharing. Thanks Shernell and you’re welcome! I just love Pumpkin Bear! !